ROANNE, France-"When we get to Paris," I told my wife, Tracy, one evening not long before we left on our trip, "We might think about going to the Comédie-Française. It's supposed to be fabulous, and by then," I concluded casually, "we'Il speak French. "When in Rome, do as the Romans do. When in France over spring break, a Purdue University French class took it one step further. From the lime they boarded the bus at the Purdue Memorial Union until their study-abroad experience ended a week later, they spoke only French. They took cooking classes with French chefs and saw the role of French cuisine in the culture. They asked questions, went sightseeing, met people and chatted for hours ... entirely in French. "Total immersion in another language and culture is an incredible and unique experience," says Heather Boggs, 20, a French major from Fairland. "... I started to think in French and even dream in French. It is an amazing and exciting feeling, and coming back to the United States was really strange." "Being forced to speak French was difficult, but l'm glad we did," says Michele Purdue, 22, a French major from Newburgh. "I didn't talk on the airplane home from Paris because the people around me were speaking English, and I didn't really want to acknowledge that the trip was over and I was leaving the French immersion." Boggs, Purdue and their classmates are taking an elective, advanced-Ievel French class titled "French Gastronomy: French Culture through Cooking." It blends language instruction with the study of French cooking and its role in French life. Nine classmates went on the mandatory trip, as did one former student, French Professor Becky Brown, and Brown's young son. Brown created the course a year ago to encourage more students to become French majors. This year, the study-abroad component was added, using some grant funds. The trip was based at the Ecole des Trois Ponts, which is housed in the 18th-century Chateau de Matel in Roanne, France. 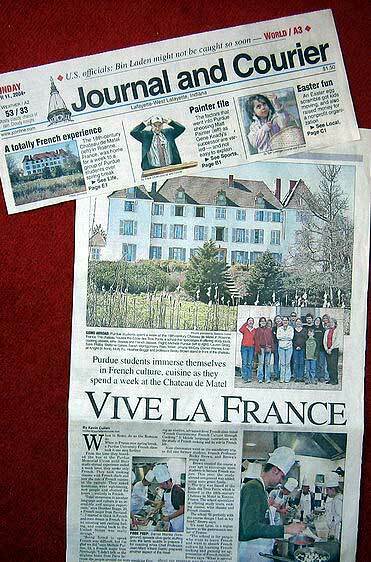 The school specializes in offering study tours, cooking classes, wine classes and French classes. The school "fit perfectly with the course design I had in my head," Brown says. It's near Lyon, in a region known as the gastronomic center of France. "The school is for people who want to learn French and want to absorb French culture by learning French cooking and gaining an appeciation of French cuisine," Brown gays. "What is special about our program was the complete (language) immersion. Any tourist can go there and cook in English." The Purdue students took cooking classes and, on field trips, witnessed chocolate making, cheese making, wine making, and the production of cooking oils. The chocolate shop was world-renowned. At the stone-ground oil press, students sampled oils made from pistachio nuts, walnuts, hazel nuts and pine nuts. They learned about the wine regions of France and the many "families" of French cheeses. "A teacher would say, 'l'II do this in English,' and we said, 'No! No! No!' " Brown says. "The students asked technical questions in French. Purdue made a really good impression over there." The students visited a medieval town, ancient churches and other cultural treasures. Because they spent most of their time in a small town, they "had to deal with people," she says. "We didn't go to Paris, where you can get lost in a big city and stay in your own little (English-speaking) world." Back on campus now, Purdue is reading French books and listening to French CDs, "Iike I don't want to go back to the English speaking environment," she says. There's a big difference between speaking French in school and talking to native speakers. Everyday French is rich in nuances and cultural connotations, she says. One of the highlights of the trip came on her first morning abroad. She and some friends stopped at a chocolate shop and asked workers there for the names of the rich, exotic-Iooking desserts. "It was so fun to have that experience of making a connection with a French person in French," she says. ''l've studied French for about six years," says Stefanie Gates, 19, an aviation technology major from Orlando, Fia. "It was exhilarating to have the opportunity to put everything I had learned in my classes together and be able to speak and communicate in a language that I have come to passionately love." Speaking with people in their language "added a depth to our trip," she says. She surprised herself by comprehending nearly everything said by native speakers in normal conversation. French meals can last three hours, and she savored all that time spent among friends. The relaxed atmosphere "welcomes and embraces friendship," she says, and makes great food even better. "We learned more than just how to cook or improve our speaking and about culture," says Daniel Wanke, 20, of Milton, Wis., who is majoring in French and political science. "We learned French and everything that word means." He found it easier to speak only French than to try to switch between two languages. ln France, a good meal is a well-orchestrated symphony, he says. The French know that foods are distinctive, in part, because of the soil, water and air of the regions that produce them. "These combinations make each thing what it is and that is why the French have over 500 different cheeses and it is what makes a fine burgundy or champagne what it is," Wanke says. "Knowing these qualities is the vary essence of creating a meal and having the right combinations is everything; without it, it can spoil the whole experience." The highlight of the trip, he says, came from sharing good food and wine with friends, old and new. Boggs agrees. 8ecause her classmates shared her passion for France, they embraced its culinary tradition. "Rather than just throwing it all on the plate, everything has an art," she says. "Every chef is an artist, a creator. From matching wines to cheese to appreciating the percentage of cocoa that goes into the finest chocolates, French cuisine takes on another leval entirely that I wonder if Americans and other cultures will ever understand." Boggs earlier spent three months in France, but she says the "immersion" experience was humbling. "You have to try to say things in ways that you are not sure of, whether it is correct or not," she says. "Half of the time, even when something is right, it doesn't sound 'French' and sounds very bizarre to them." She'lI soon be returning for a six-month internship. "The hardest part about having such a love for another culture is not having the ability to bring it home with me and experience it with my loved ones," she says. "It is a very personal thing, and I think that is why it was so special going with my class. I could share it with others."